The way I see it, there will be 3 pure-travel days on this vacation. There are of course the days we fly in and out, and then there was today. 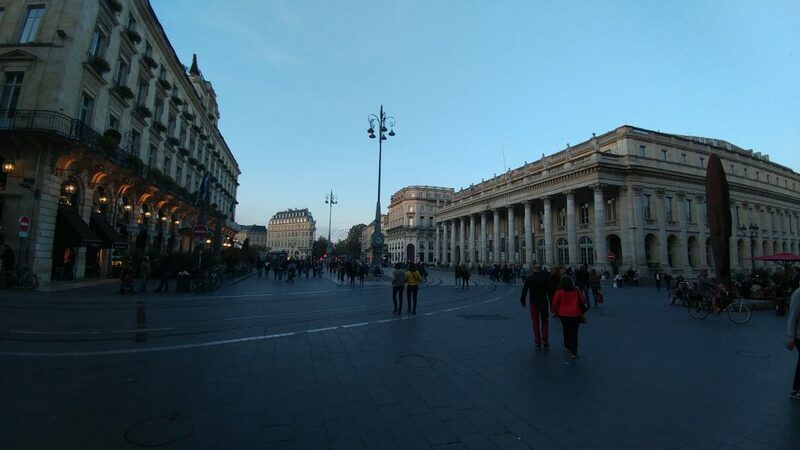 After finishing up the previous blog post, we sat somewhere around 7 hours on the trains in total until we arrived at Gare de Bordeaux-Saint-Jean (Bordeaux St. Jean station). But the journey was not over by a long shot – the place we would be staying, Rolland de By in Begadan, was still a two-hour drive north. Because we didn’t arrive in Bordeaux until a little past 7pm and it was Saturday, most car rental places were closed. We got around this by making reservations at the Avis located at the Bordeaux–Merignac Airport, about a half-hour drive away. I checked Google Maps, there was a route we could take via a couple of busses, or we could use Uber again. I had planned on the latter, being on vacation and not wanting to lug all our stuff through crowds. Yet, in a moment of pure serendipity, literally the moment we walked out of the train station, a two-car bus drove into the loading zone with the words “Merignac Aeroport” on it’s sign. It was too good to be true, but alas, 3 Euros later we were both boarded with our things on a luggage rack they had near the seats. Being a public bus, it did get crowded from time to time, and stopped many times along the way. Eventually we got a bench seat to ourselves near our bags and about an hour later we arrived at the airport. It was 8:15pm and our car reservation was for 8:30pm, the timings just couldn’t have worked out better for us. After a quick bathroom run, we got our passports and international driver’s license out and completed the car rental. We walked our bags to the car – an Opel Corsa with a manual transmission – and spent a humorous amount of time figuring out the basics, such as how to open the trunk, or how to turn on the headlights. Finally loaded up, we set course, Google Maps navigation guiding us. Driving in France for some reason was a little more stressful for me than when I drove in Italy. The roads are a little tighter here during main stretches with small or no shoulders at all, and the tendency for the average driver to speed or tailgate you for not speeding is far greater. Also one needs to get used to circles – myriad circles – copious amounts of circles. On average during sections, a circle every 800 meters. The longest stretch without a circle the whole way? About 8 kilometers, during a 73 kilometer drive. Again, circles. A plethora of circles. Sick of reading the word circles? Not as sick as I am of driving through circles. But at the end of a very long day of travel, with no pictures to really show for it, we arrived at the enchanting Hotel Rollan de By. We had emailed the proprietors earlier in the week that we would be arriving late, a good move since they only occupy the front desk from 8am-noon and 4pm-8pm. Their response was to give us the access code for the front door, and said, “we will leave your key in the lock to your room.” Seemed a little odd, until we arrived and realized, we are the only occupants here tonight. Yup, we have the whole hotel to ourselves, at a winery, with no supervision. Vive la France. 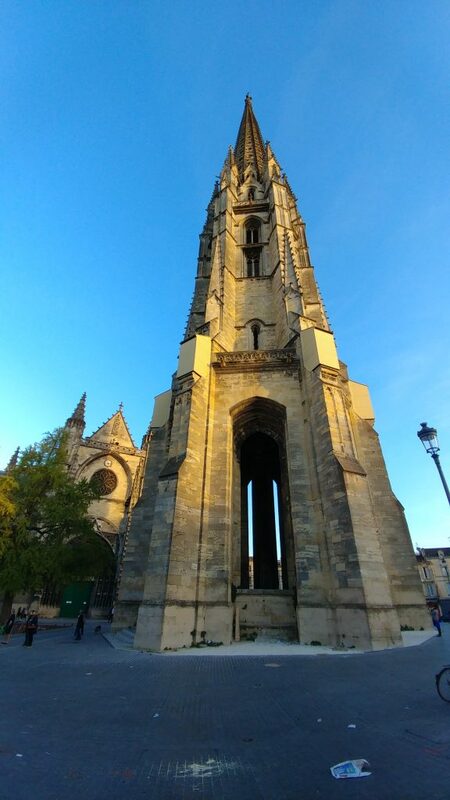 Up early to begin our day touring Bordeaux, we were the beneficiary of more timely happenstance – last night was the daylight savings time fallback here, so we fortuitously gained an hour of sleep when our phones automatically readjusted. After showing up, we went downstairs and finally met the hotel staff, who were more than eager to give us booklets and maps, and even went so far as to circle picturesque/favorite regions for us. Many reputable chateaus have a classification from 1st to 5th. The reason is largely historical, practically useless in today’s age. Commissioned by Emperor Napoleon III in 1855, it ranked Bordeaux chateaus from 1-5 based on their reputations and market prices. In the store, should you see a Bordeaux wine labeled with a classification, it is not the number that matters, so much as the fact that they have a classification, meaning they were around and worth rating in 1855, and following heavily-imposed traditions, should still be of a similar caliber today. Of course, a lot can change in 130+ years. 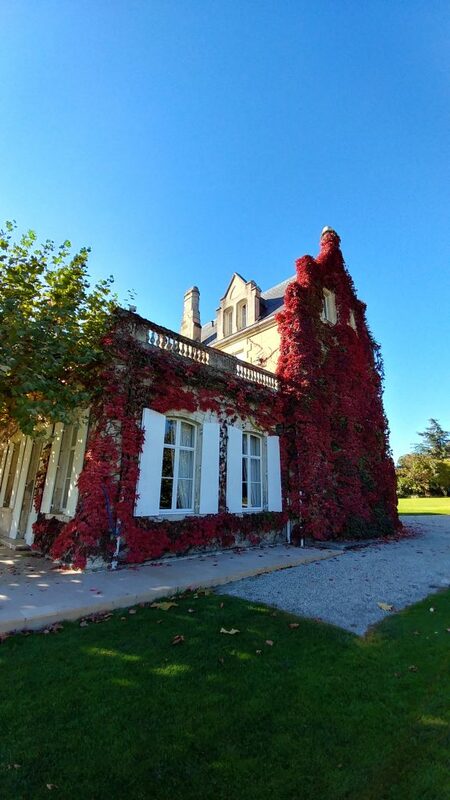 Most chateaus will produce multiple wines in one season, but only one can carry the name of the chateau in it’s pure form, such as “Chateau Lynch Bages” with no other qualifications. This is known as their “first label”, and is their highest-quality wine, usually consisting of grapes harvested from vines +/- 25-60 years of age. The wines produced from grapes of younger or older vines will go into what is called a second-label, usually a high-quality product, but not the chateau’s best showing. Second-label wines will not carry the exact name of the chateau on their label, they will be qualified in some manner. Also, they will not carry the 1855 classification on the front label. 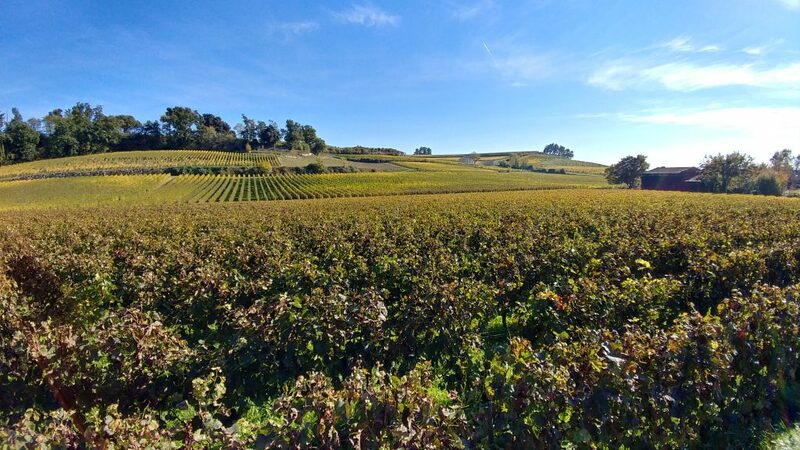 The rules of the different Bordeaux regions are extremely strict. As an example, in certain regions, all white wines will consist of Sauvignon Blanc and/or Semillon Blanc grapes. One will find other grapes in the mix – Sauvignon Gris, Merlot blanc, Ondenc, etc – but in no case will a Chardonnay (for example) be in the mix, along with many other grapes. Should you ask why this is the case, you will be told something along the lines of, “it is forbidden”. Having covered the basics, we’re onto our first stop, Chateau Lynch-Bages! We arrived within about a half hour in time for our 11am appointment, and parked near a smaller, inconspicuous building. The tour already beginning, we first witnessed their fermentation tanks, all stainless steel. Not too much to see here – these days, most of the process is computer controlled. 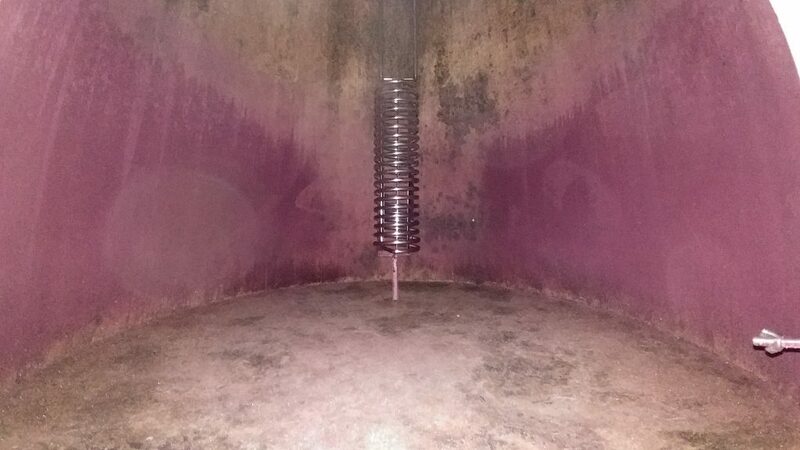 There is a coil inside each of the stainless steel tanks through which water flows, either hot or cold, to raise or lower the temperature of the fermenting juice. The computer controls the flow and temperature of water. Each tank has an inlet at the top and an outlet / cleanout at the bottom, and again the computer takes care of controlling pumps that relocate or recirculate liquid inside of the tanks. What was perhaps more interesting was the old section of the building, and the history of how they used to make wine. 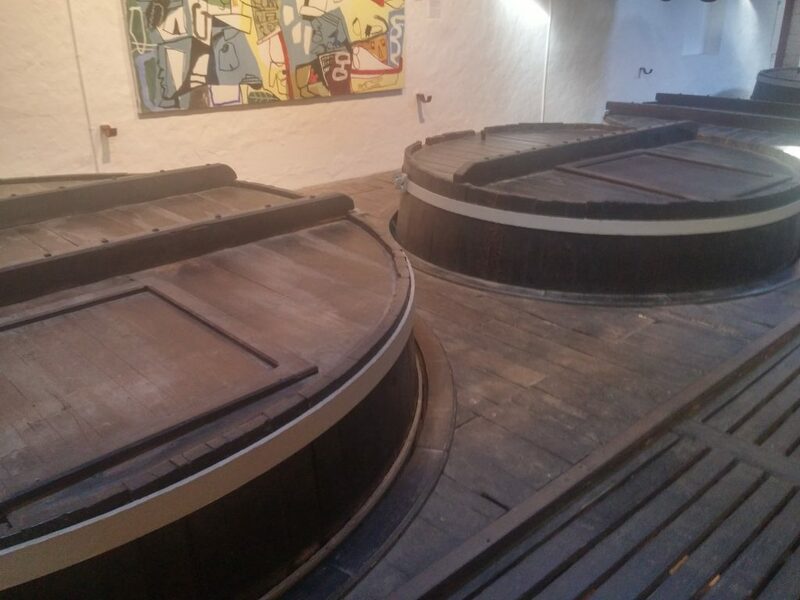 Instead of stainless steel, the tanks were made of oak. On the side, each tank lists a sequence number, as well as it’s capacity. Ascending up a floor, one can see the tops of the wooden tanks, where the grapes & juice would be loaded in. If you look closely on this photo, on the bottom right side, you will see a railroad track. There are 4 of them along the top, upon which a work table sits. The red door on the right side of the photo is where grapes were brought into the building, hoisted from the horse carts via the swinging bucket to the left of the door. Bunches would be loaded into the circular container right behind the door. From there, the table the chateau worker is holding is filled with white tines facing upward. This is how they used to de-stem the grapes, bunches were pulled along horizontally and the tines would pluck the grapes off, which would then fall through the holes into the area were the worker was standing. 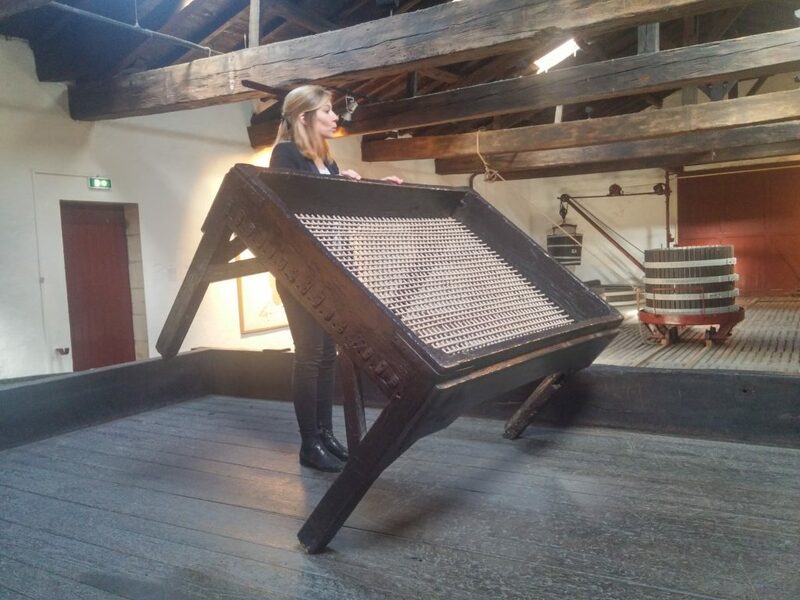 At the time, the worker would also be walking in place non-stop, to crush the grapes. The whole platform could be moved along the tracks, and when full, uncorked on either side allowing the juice and grapes to flow into one of the wooden tanks. The tour guide explained this was the work for the women, perhaps because it was physically less demanding than other jobs, or perhaps simply because they would tend to have cleaner feet. An interesting tidbit, between fermentation cycles, the wooden tanks would need to be cleaned. However, fermenting causes a build-up of carbon dioxide which could potentially be fatal for a worker who went into the tanks. The simple solution? Bring a candle in with you, if the candle goes out, there is not enough oxygen, and you should leave immediately. 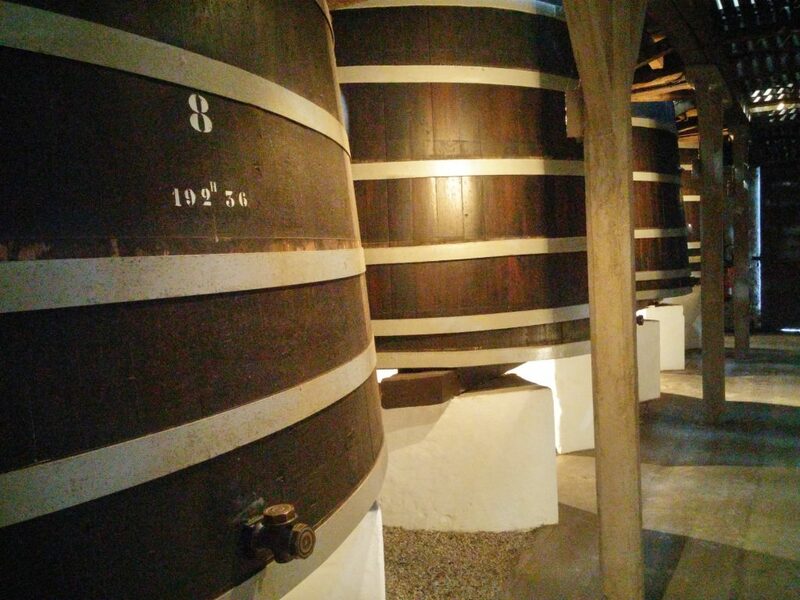 Finally, we continued on to the aging cellar, where they had an impressive amount of barrels stored. Most wineries/chateaus will keep their barrels with the access hole facing straight up. 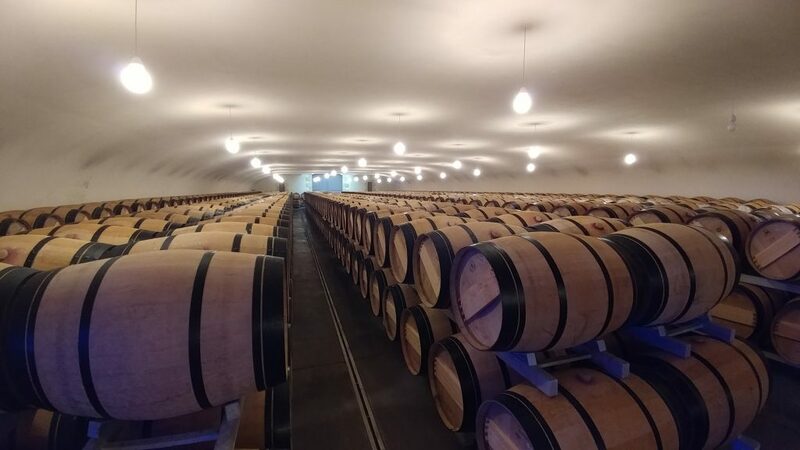 However, at Lynch-Bages, they kept their barrels slightly askew, with the access hole at more of a 45-degree angle, and with a rag stuffed between the barrel and the stopper. The reason is to reduce the amount lost to evaporation – the “angel’s share”. By keeping a rag in place, and exposed to liquid therefore kept moist, a tighter seal is formed so less airflow makes it inside the barrel and less moisture escapes. Some is indeed lost through the rag itself, but apparently less than using the traditional ragless method. In any case, regardless of rag use or not, every couple of weeks a barrel is sacrificed in order to top off what is lost out of every other barrel. This keeps the amount of air in the barrel at a minimum and helps prevent oxidation. We walked past the owner’s collection, a musty room filled with old vintages. Perhaps the most spectacular of the collection was kept in a glass dome, a half-bottle of their wine that astronaut Patrick Baudry brought to space and back – as of Oct 2016, the only bottle of wine ever to complete such a journey. One has to wonder how this might affect the aging, though I can’t imagine such a priceless bottle will ever be opened for any occasion. After the tour at Chateau Lynch-Bages, we stopped at their store to pick up a bottle of their 2010 vintage, an excellent year. Then right next door, we stopped at the Cafe Lavinal for lunch, where I got a grilled lamb rack and Cait had a proper AAAAA Andouillette sausage, made using real pig intestine/colon. It definitely had a unique smell and taste to it, the waitress tried to be very clear about that up-front. But Cait soldiered on and made respectable progress on it, even the waitress was impressed when she came to bus the table. Soon we were on the way to Chateau Pinchon Longueville Baron, where we actually had a private tour for just the two of us. We got a brief tour of the chateau, learning about the family that originally owned it. There is a chateau with a very similar name right next door – when the original owner of the land died, he left 3/5ths to his 3 sons, and 2/5ths to his 2 daughters. This ended up becoming two different chateaus, and over time, they drifted apart. Today, they have nothing to do with each other really, except being architecturally similar and in close proximity. As with many chateaus we have already visited, Pinchon Longueville Baron is today no longer owned by a family, but by an insurance company. 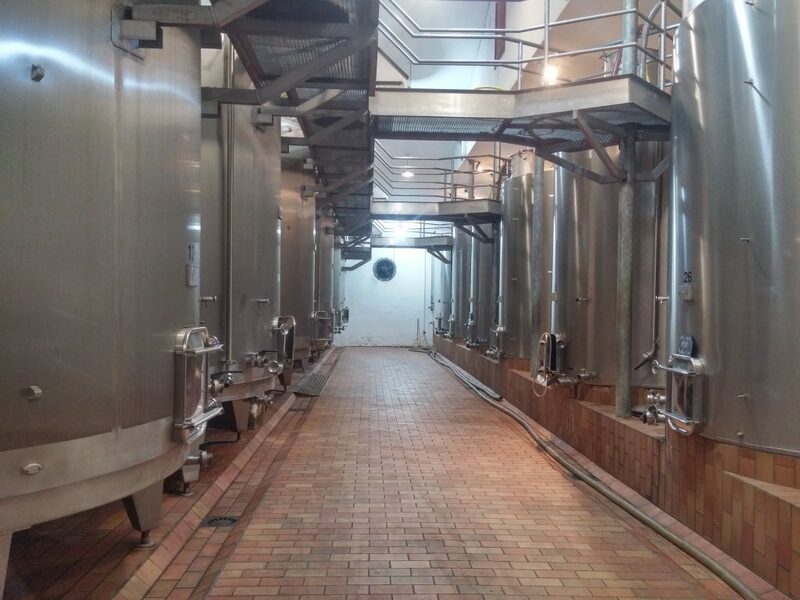 However, the lineage which used to work these places is still involved in the routine wine-making operations. We eventually descended underground, to the fermentation tanks. A clever design, their room consists of concentric rings of tanks. On the outermost two rings, stainless steel tanks. The second-to-innermost ring, wood tanks. And finally, in the middle ring, 6 underground cement tanks which can be seen as capped holes in the floor in the right-middle of the image above. The reason for concentric rings? As fermentation progresses, juice is moved between tanks by a pump. But using this layout, they minimize the amount of piping necessary, reducing costs, and they also minimize the amount of time the juice is in the piping, a relatively thermally-unregulated area. Eventually, the products from all tanks will be combined. Moving on to the aging cellar, another vast quantity of barrels was to be found. The location of this aging cellar? Right underneath the reflecting pool in the chateau building photo above – look closely in the grassy area to see it. This helps to thermally regulate the room, and again minimizes the costs to the chateau. We moved onto the tasting room, and the results were no doubt delicious, but neither of their labels stood out greatly to us, and the prices were quite high. We decided not to purchase a bottle, but we did still have to pay for the tour at this place, 8 Euros a piece. The price was well worth it considering it was a private tour through an impressive facility. And finally on the day’s docket, we stopped into Chateau Pontet-Canet. 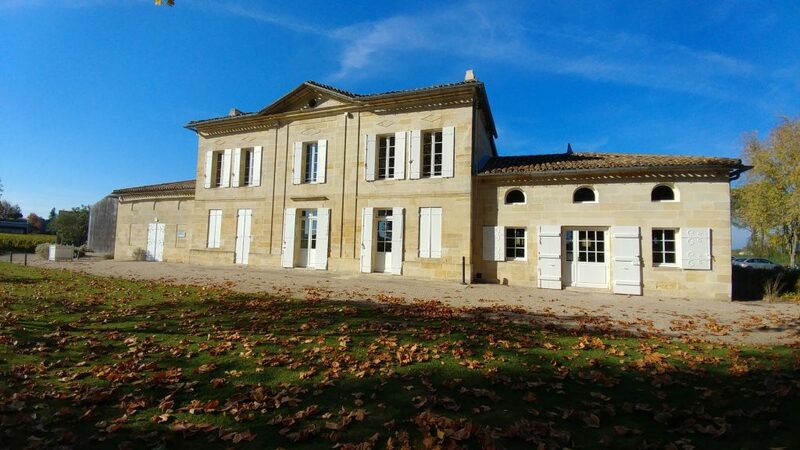 This chateau owns one of the largest plots in the area, weighing in at 120 hectares (about 300 acres). The first part of the tour was outside, where the tour guide had us load into a large golf cart. She drove us directly into the vineyard for an impressive view of their facilities and grounds. Much like the first tour of the day at Chateau Lynch-Bages, this one also had a history component, as their original facilities are still intact. The process again included wooden tanks. 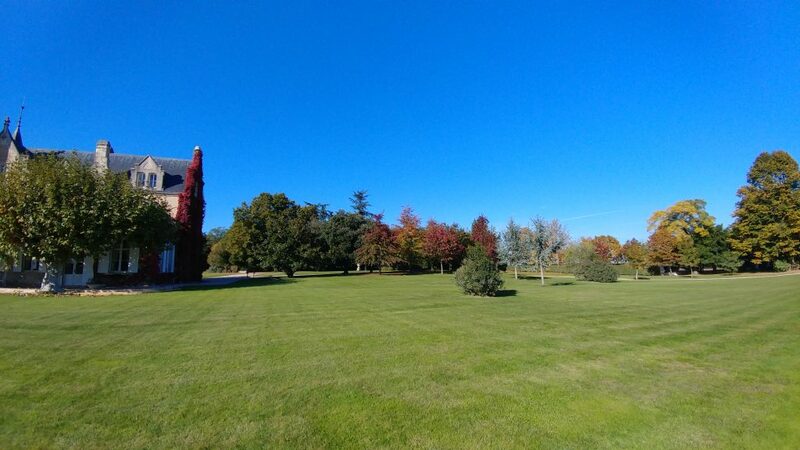 If the architectural style looks familiar, it is because it was designed during the same time period as the Eiffel Tower. We didn’t get to go to the second floor here, but the setup was much the same, with a twist. Once steam power came along, this chateau actually mechanized their second-floor rail system with pulleys and ropes, to reduce the burden on the workers and increase operational efficiency. Burying nearly 1000 “horns” of cow manure during the winter to fertilize the ground. Using only natural insect repellents instead of pesticides. Tending to different parts of the plants during different parts of the lunar cycle (trimming leaves is more stressful to a plant during full-moon, when the leaves are active for more of the day and night). Eliminating their use of tractors in favor of using horses. Hand-picking only, instead of using mechanized pickers (though many non-biodynamic chateaus also still do this, bringing in hundreds of workers for harvest, usually Portuguese, and more often than not, the same people from the same villages year after year). But their efforts don’t stop there. 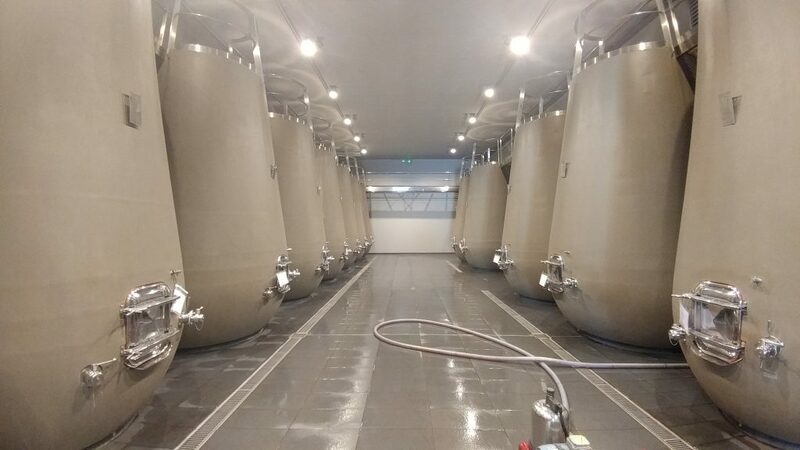 All of the fermentation tanks they use are made of cement. To prevent seepage through the porous stone material, a layer of tartaric acid is applied to the inside of the tank. And much like their stainless brethren, these tanks still include a temperature control coil. One massive benefit of using concrete tanks is “thermal inertia”, the idea that a concrete tank will not fluctuate in temperature nearly as much as a stainless steel tank will. This means the thermal coil will be used far less frequently, saving energy. …their commitment to the environment has them mostly aging in custom-designed concrete tanks, for which they have a patent on the design. 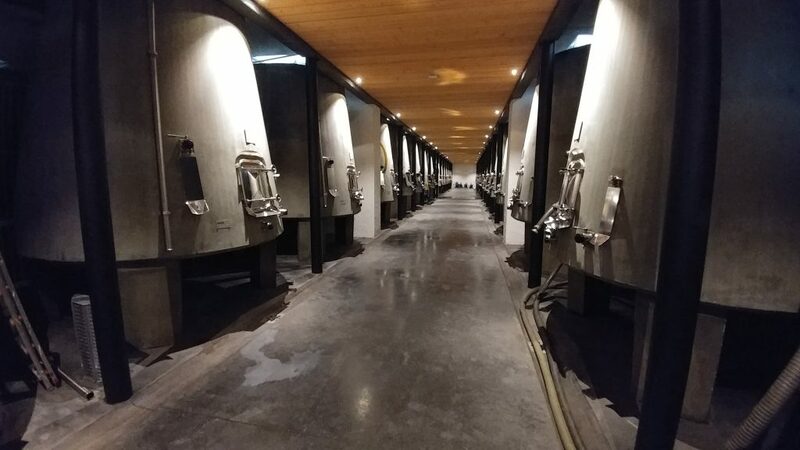 These aging tanks are also lined, however, instead of using tartaric acid, the material in which the grapes to be aged best grow in is used – granite and crushed stone for Cabernet Sauvignon, and clay for Merlot. 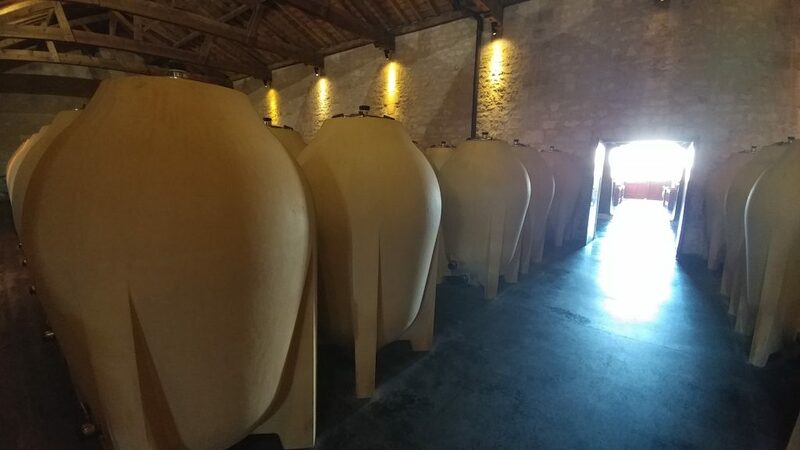 In the end, again as common in all of Bordeaux, the final results from all aging tanks, wood or cement, will be blended before release to ensure all bottles have a consistent product. 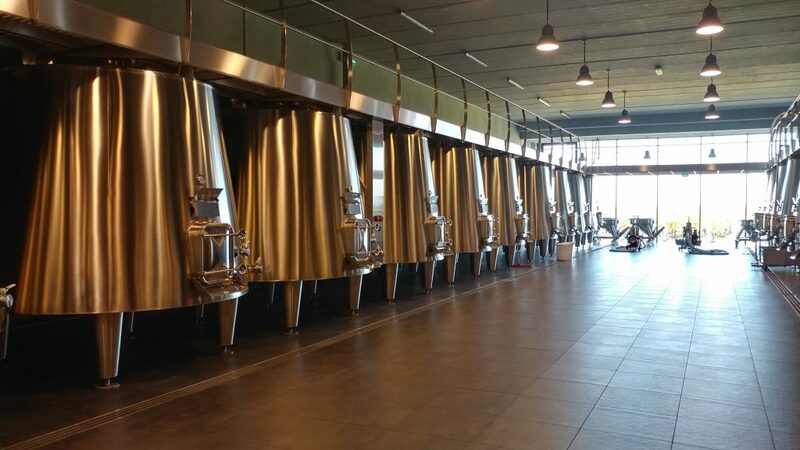 These tanks are relatively new for the chateau, 2012 is their first varietal to use them. 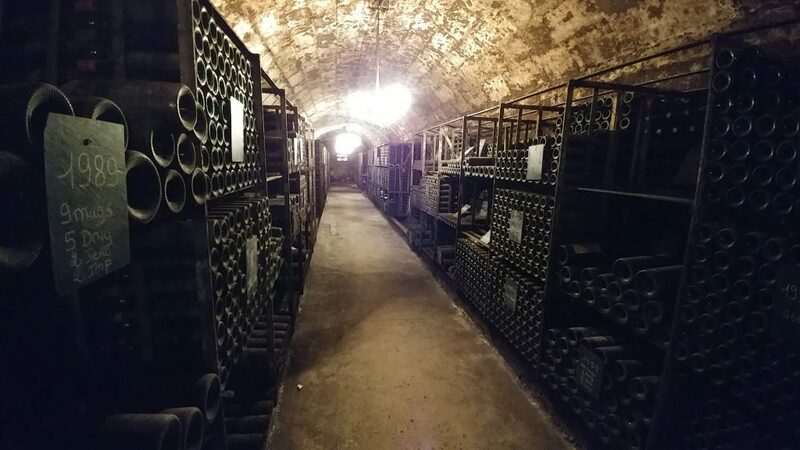 Of course, no chateau tour is complete without a glimpse of the owner’s private stash, and since this one had a full underground cave, the collection here was extremely impressive. Back upstairs in the tasting room, we tried their first-label wine. It was absolutely fantastic. Although a bit on the pricier end for all of their options, we picked up one of the relatively cheaper 2012 varietals, the first to use those cement tanks. The chateau suggests it will age up to 30 years, we most certainly won’t be waiting that long. Much like wineries in California, most Bordeaux chateaus stop hosting guests/tastings around 4pm-5pm, so we had some time to wait before most places would open for dinner at around 7:30pm. 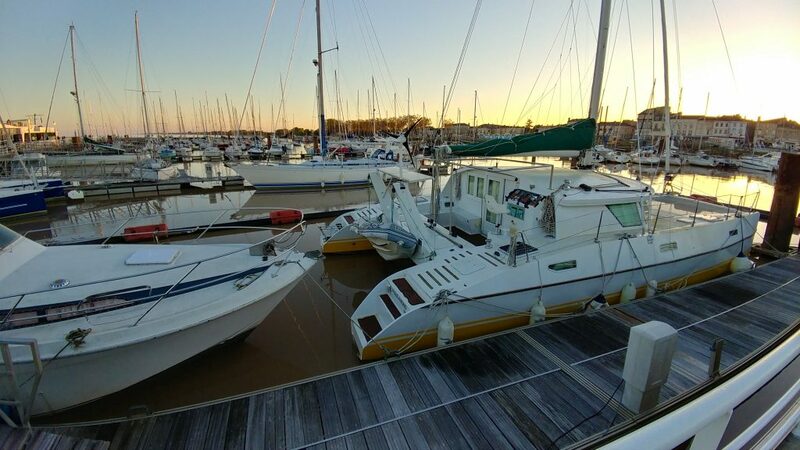 We drove about 5 minutes and parked in downtown Pauillac to walk around for a while. Passing multiple groups playing boulle on the dirt sidewalks, we found our way into a small seaport. But Pauillac was quite small so it didn’t take too long to reach the other end. We crossed the street and turned back, happening upon a cute small wine shop named La Cave la Route Des Charteaux. Inside we found a 2005 vintage, another excellent year, and got it for a very reasonable price. As well, we found as a more recent 2010 vintage we wouldn’t feel as guilty about drinking sooner rather than later. It was now about 7pm, and we were a half hour from the place we planned to have dinner. But, we first wanted to talk to the hotel staff about breakfast tomorrow and drop off our wines in the hotel room. Since the hotel and restaurant are in close proximity, we stopped by the hotel first and accomplished our mission. We set out for dinner at La Maison du Douanier where I experienced another life first and had a veal dish, a stuffed breast. Cait managed to enjoy a mushroom-based main dish there, not a usual favorite food of hers. We paid and left, and went back to our hotel room to document our day and catch some sleep on the earlier side. Tomorrow would be another early day with hotel breakfast at 9am before our first chateau appointment at 11am! Our earliest day yet here in Bordeaux, we were up in time for a hotel breakfast that was far too large for either of us to finish. Plain and chocolate croissants, fresh fruit, real yogurt, applesauce, orange juice, coffee/tea, 3 different jams for 3 different types of breads… mon dieu! Also a little more housekeeping, another laundry run was due. The hotel documentation said that a laundry load would cost 5 Euros, so at breakfast we inquired about doing laundry later tonight. The response we got surprised us, “well if you leave your dirty clothes here this morning, we will have them washed for you by night.” After coming from a 5-star hotel attempting to charge almost criminal prices for laundry (think 10 Euros per pair of pants), we were taken aback. But lo and behold, we left them our pile of laundry, and when we returned later in the night, there were two piles of clean clothes folded in our room, sans jeans which needed some extra dryer time. Compare this to even the Lyon laundromat, for which we paid 13 Euros and needed to hang around personally for over 2 hours. Everyone, if you are planning a Bordeaux visit, plan to stay at Hotel Rollan de By, you will certainly be more than comfortable in your stay. 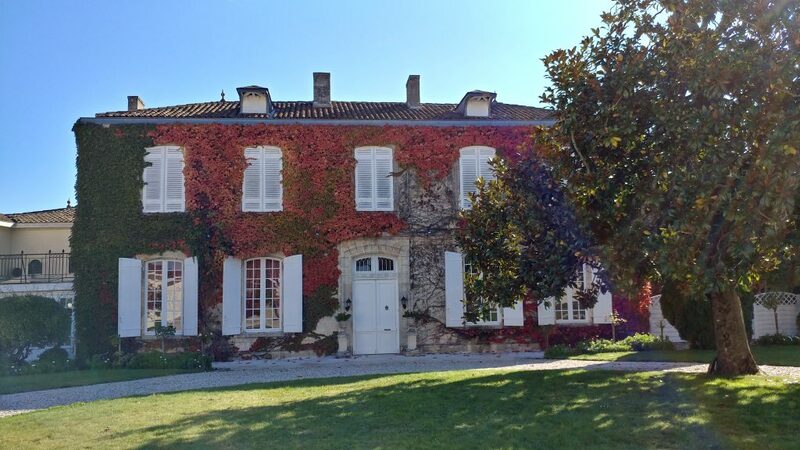 All our hotel business aside, we set a course for our first destination, Chateau Prieure-Lichine in Cantenac. We joined the tour right on time and our first stop was the modern fermenting tanks. This chateau has joined the ranks of others and gone with concrete. 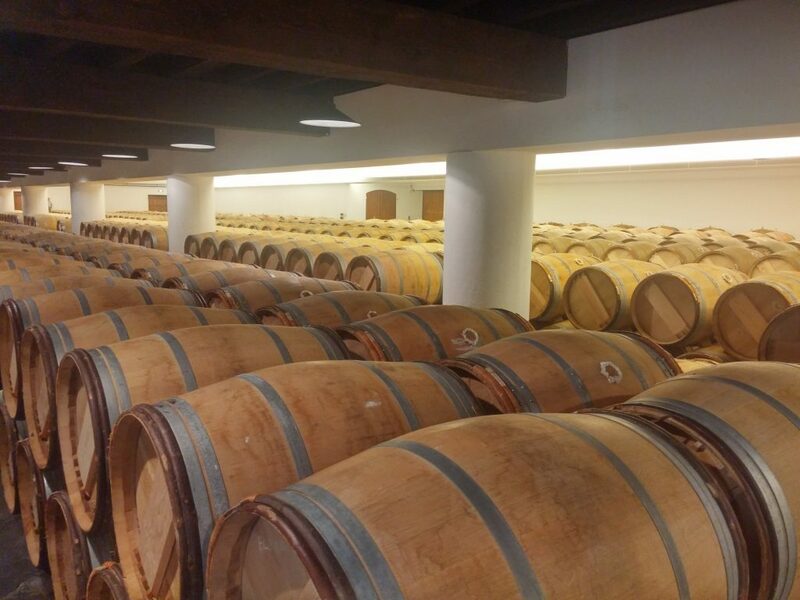 Of course, no chateau tour would be complete without a stop in an impressive aging cellar. Some interesting tidbits we learned of this place, they source their barrels from 7 different cooperage shops all around France. 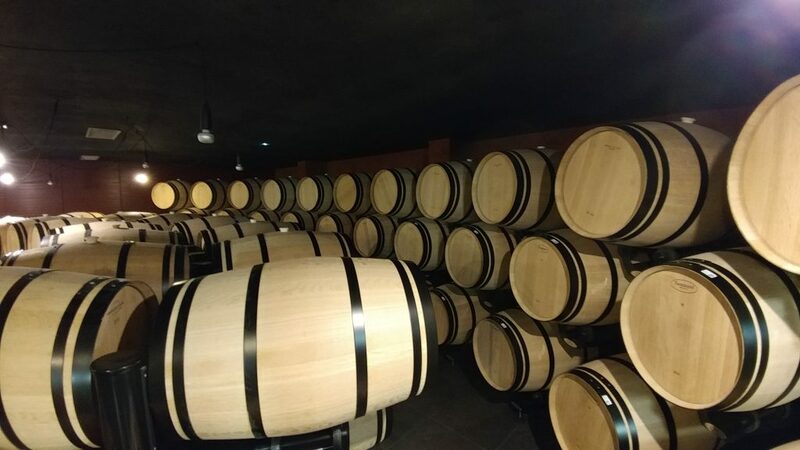 Since these aged individual barrels are all blended, by diversifying their barrel portfolio with all medium toasts, they seek to attain a true average product representative of medium-toast French oak wood. In the aging room, instead of electric dehumidifiers, there are bowls of sawdust and wood shavings scattered around. Not sure how effective this method is, I would assume there’s a backup system, but surely it does work to some degree and is far cheaper to operate. 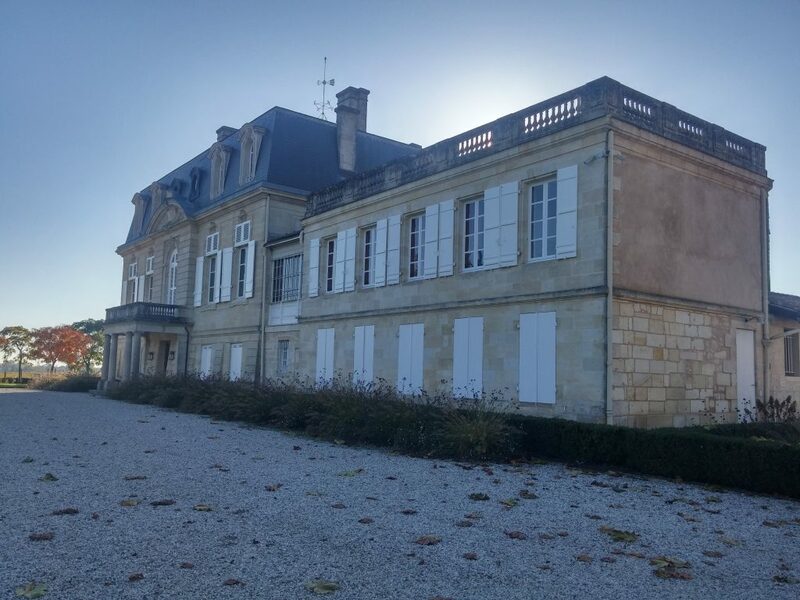 Although I didn’t get a photo of the cellar collection, this chateau had a unique opportunity for collectors out there – one can buy a collectible vintage (say, 1982) and have the chateau continue to store it for them in their cellar in perfect conditions. When one is ready to consume, just stop by and pick it up! 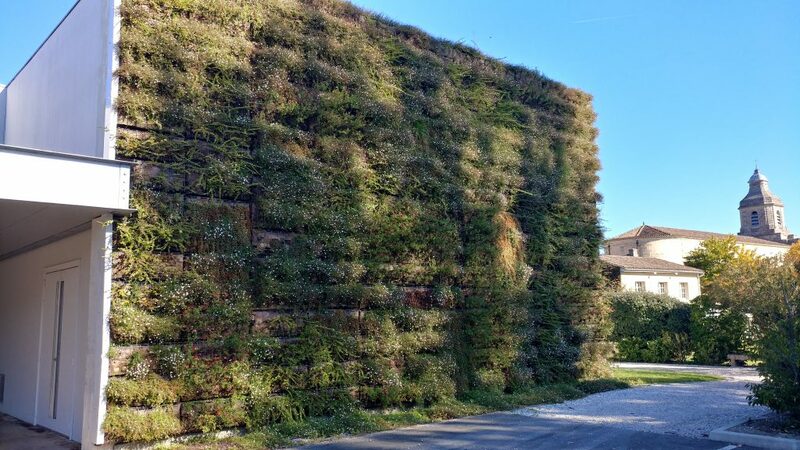 To make up for the lack of cellar collection photo, here’s their outside garden-wall, designed to help keep internal temperatures low without using additional energy. We tasted the 2011 of their first and second labels, with the first label being a tremendous product. 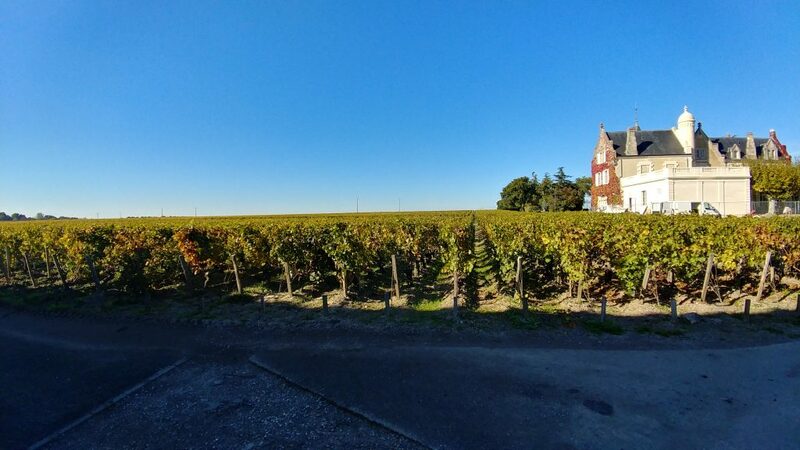 We walked over to the store, their prices were very reasonable, and we found that for a couple Euro more, we could get a bottle of the 2010 vintage, widely accepted to be superior to the 2011. We couldn’t pass up such an opportunity, and one will adorn our wine rack upon our return for many years to come. Upon departure, it was lunch time. Checking Google, we found Le Savoie to have great ratings, and had passed it on our way to the first chateau. We drove to it for all of 4 minutes and parked on the street before we were seated. Google Maps reported that the next chateau on our list was a 6-minute walk away from here, so we had about an hour and a half to eat. Cait had a duck appetizer, with a pork rib main dish and a chocolate-based dessert plate. I was a little worried about time and only got an entrecote (rib steak) for main dish, and a cafe (espresso) for dessert. Time ticked by as we sat outside in the 70+ degree sun and turned the perfect shade of pink, soon it was nearing time to leave, and our desserts had still not come. Alas, they arrived 3 minutes before we absolutely had to depart, and those around us took witness to something special and perhaps uniquely American, the speed-meal. We finished just in the nick of time, and having paid l’addition before the desserts came out, we walked briskly to Chateau Lascombes, arriving slightly late but not last to begin the scheduled 2pm tour. It began like many, with a walk around the original chateau. This one was impressive by all accounts. 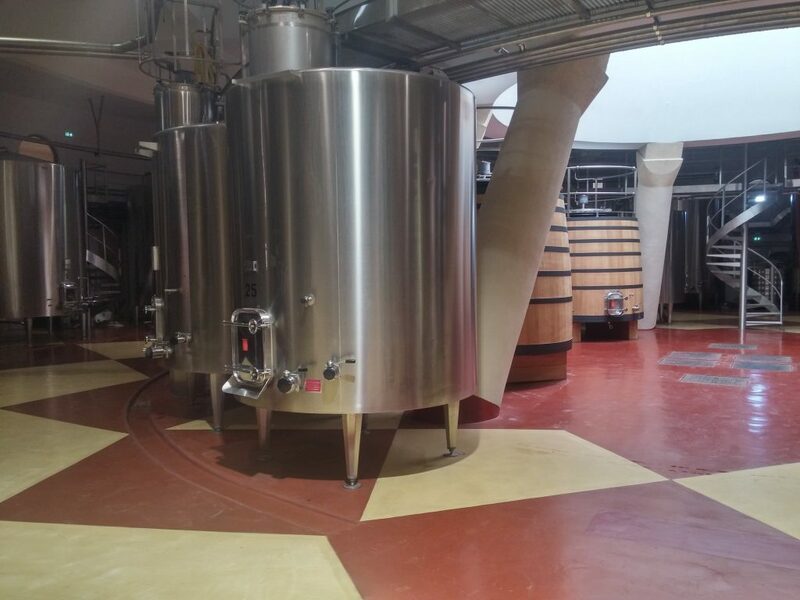 Here, they used a mix of wood and stainless steel tanks, with underground cement tanks available for the mixing processes. 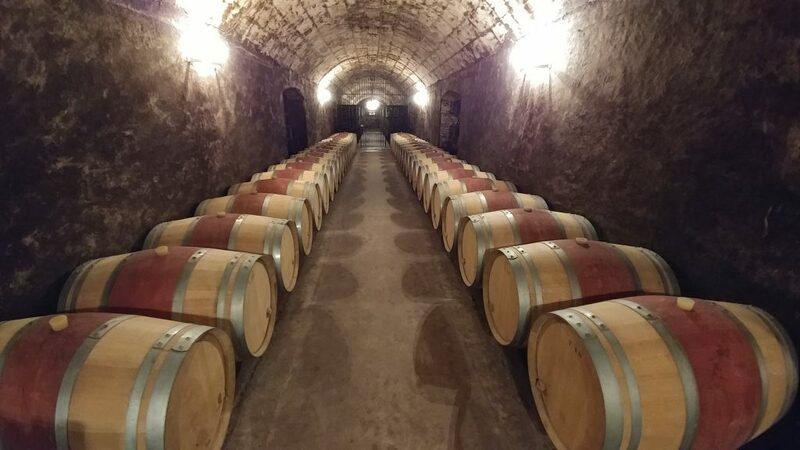 Of course, the wine will be aged in French Oak barrels in another impressive aging cellar. This chateau used a style in the barrel known as “on lees”. 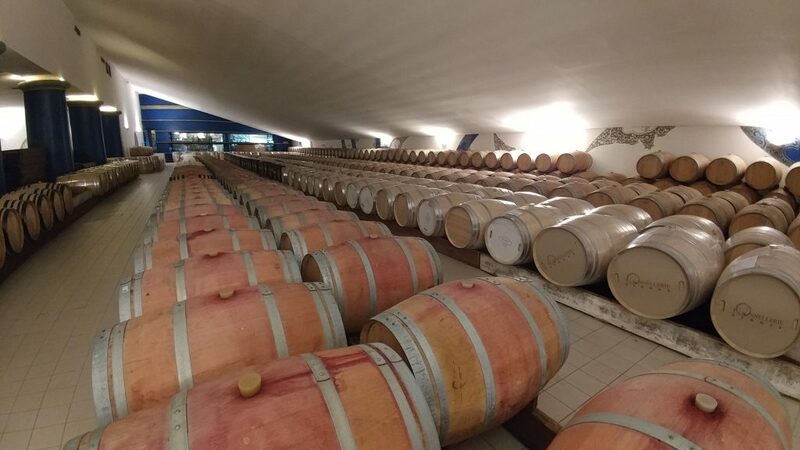 Whereas most places will remove dead yeast and sediment from their wine in the barrel in a process known as racking – where the wine is moved between different barrels – this chateau instead had a custom barrel racking setup, where the barrels are kept on small rack-mounted castor wheels. 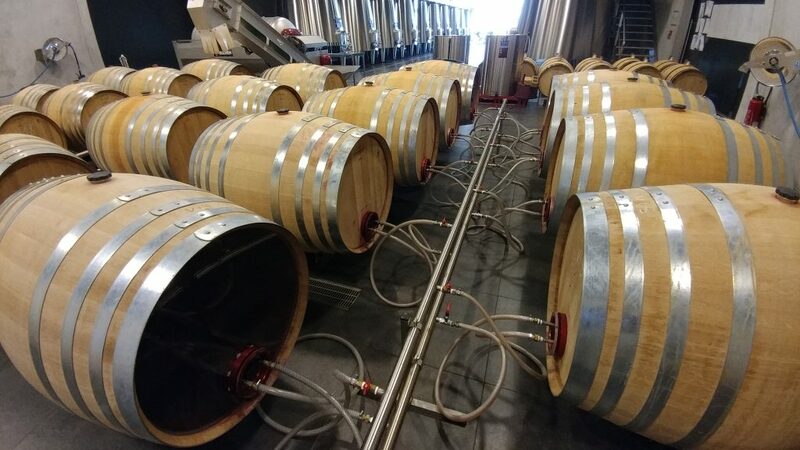 In the old days, they’d go around with a cane and disturb the sediment to mix it back into the wine, now all they need to do is rotate the whole barrel a time or two in-place and the sediment is again suspended for a while. This process will be repeated every few weeks for months. 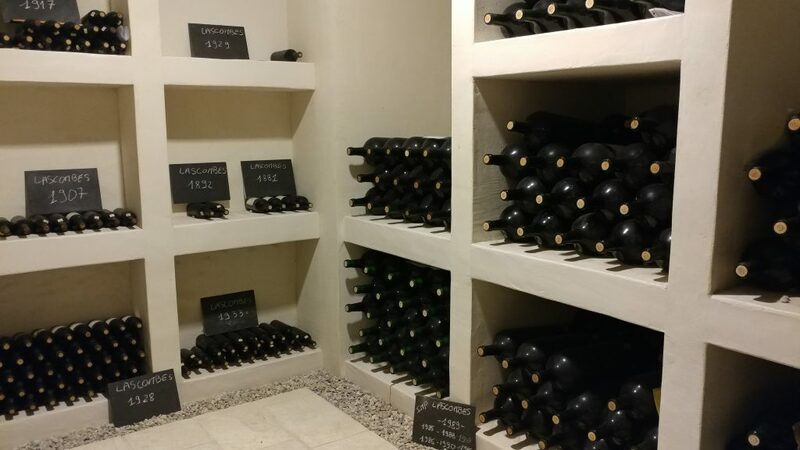 The owner of this chateau has an impressive collection as well, with vintages dating back to 1881 that are surely good for only salad dressing at this point. 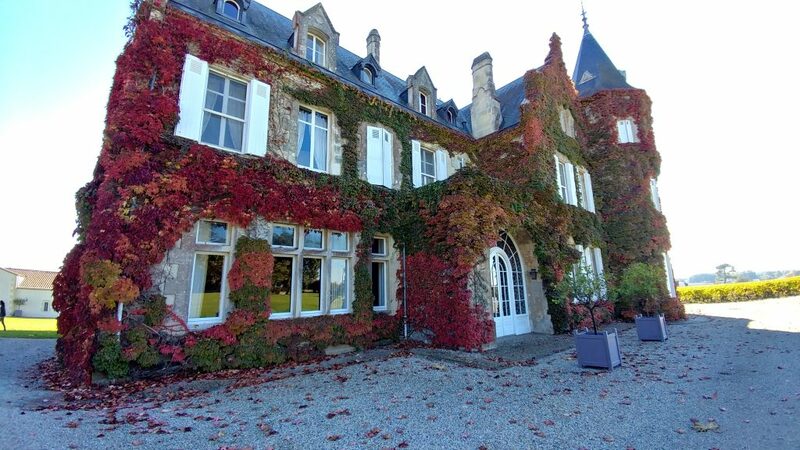 We did again learn, however, that the owner of this chateau is no longer the original family, but an American holdings group involved with insurance practices. This was becoming a theme in our visit, that chateaus owned for generations by the same families were being bought out as of 2007, 2011, and the last couple of years. In the tasting room, we were impressed with how full-bodied the wines were. The second label was strong and forceful. The first label was a bit more subdued in body, but smooth and well-rounded. The strong body on both wines is no doubt a product of the on lees method of production. We thanked the tour guide and headed out back to our hotel room before it would be time for dinner. Following the advice of the hotel staff, we ended up at Le Ble Noir, where I had an appetizer of 4 shrimp in a whiskey cream sauce. They were delicious, but upon giving Cait a small bite, she almost gagged, and – shoutout to our cousins from Mississippi – swore she would never eat another shrimp again unless Sandi picked it up with us from the dock fresh that morning, and Mike shelled, marinated, and grilled them on a stick. For main course, I went with the fish of the day, a flatfish filet, and Cait had the buckwheat crepe with 3 cheeses. Splitting a cafe gourmond for dessert, we headed back to the hotel for sleep with another full day ahead of us, including having a second hotel breakfast at the same relatively early hour as the day before! We didn’t have to get up quite as early this time, our first tour appointment was for 2:30pm at Chateau La Dominique. 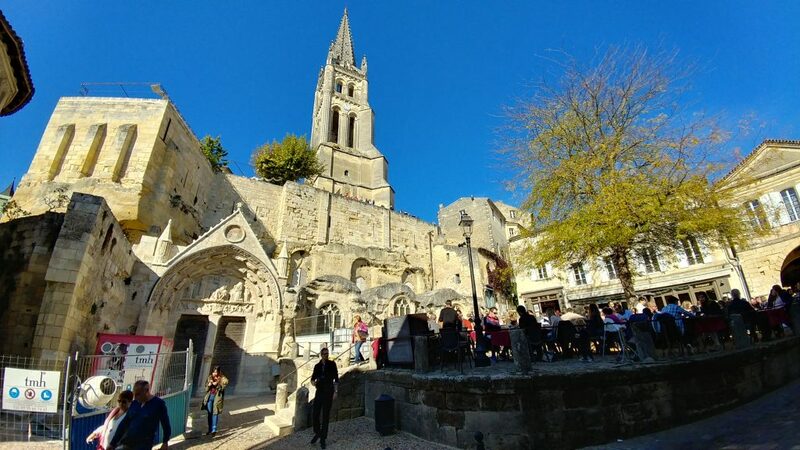 After enjoying another lovely hotel breakfast, we decided to first check out Saint Emilion, the town in which the Chateau resides, and home of the original French macaroon. 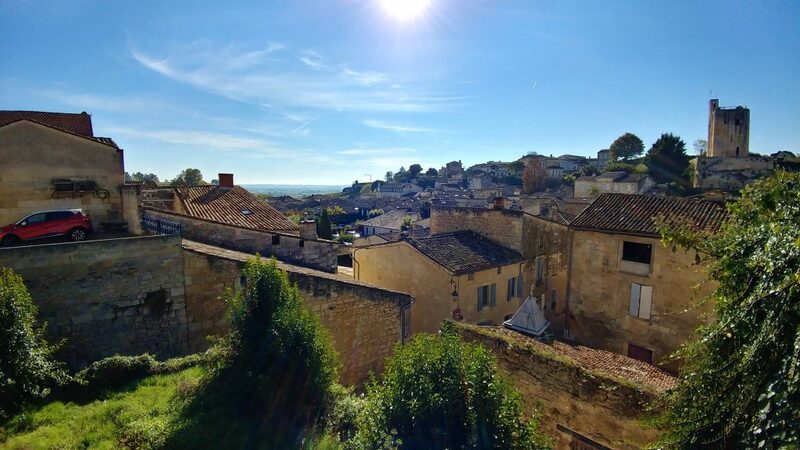 The town is gorgeous, and full of both wine stores and bakeries, with grapes growing as far as the eye can see in most directions. We didn’t have long here until we needed to make our way to Chateau La Dominique. We began our tour, which started atop the roof of the winery, where there was a small restaurant and wine bar. 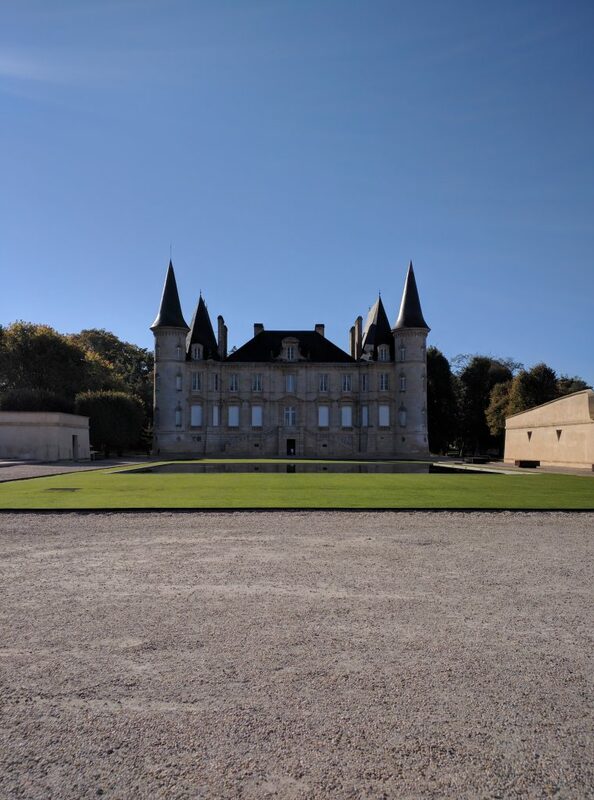 This Chateau was a little artsy for my personal taste. Looking at the photo above, the glass pebbles that catch the eye have different hues, matching the proportions of cabernet sauvignon, merlot, and petit verdot that the winery uses in their first label. 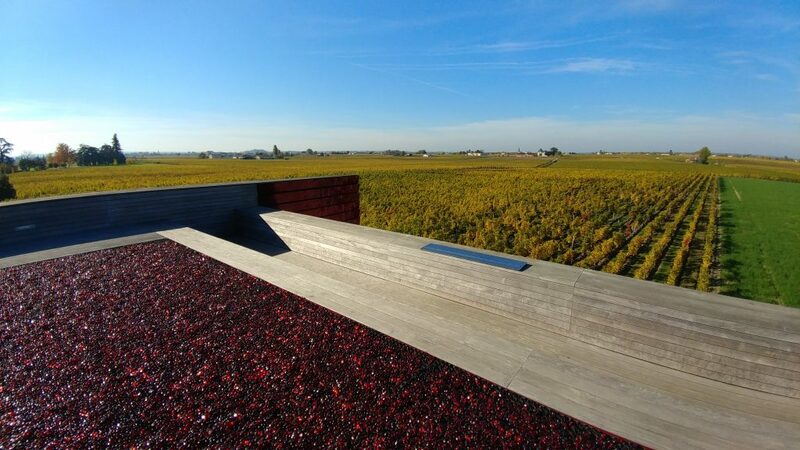 The siding of the building, visible towards the grape fields center-image, starts out with a lighter hue at the top, and descends to a darker hue on the bottom, representing the phases the wine progresses through as it ferments and ages. And the killer of all facts about this chateau – they don’t have any vines older than 40 years old. After 40 years, they rip up any remaining vines, to prevent disease – which sounds akin to a war crime in our book. 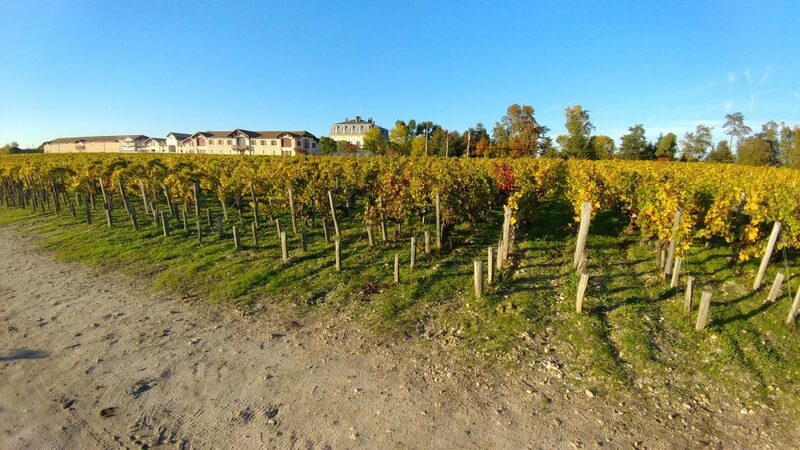 This chateau also has a policy of rotating their varietals much as a farmer would rotate crops, but again this seems superfluous, since all of their grapes are of the same species and therefore likely absorbs a nearly identical mineral profile. On to the aging room! 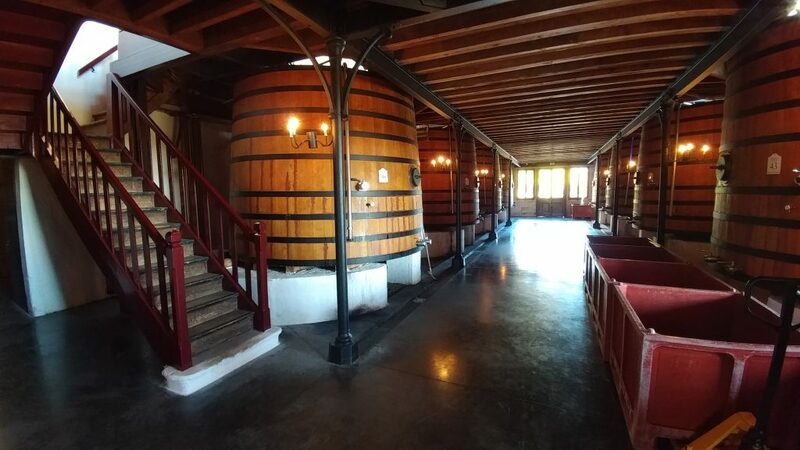 This chateau also used the castor-wheel racks, but it seemed largely unnecessary, they do not ferment “on lees”, the only rotation they really do is to move the access hole from 10 o’clock to 2 o’clock. 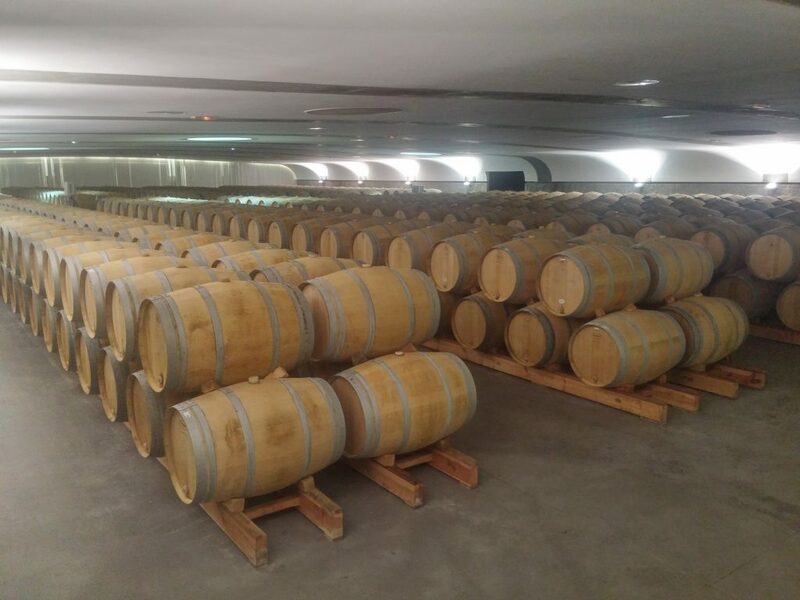 It is never kept at 12 o’clock, that is where the air inside the barrel will sit, and it is best to have the access hole under the level of the wine fluid, so as to reduce the amount of oxidation which occurs in the barrel. This chateau went slightly out of order, and the second step of the tour was actually the first step of the process, the fermentation tanks. They use only stainless steel for this. They use only the pump-over method to extract from the cap here, no punch-down at all. Perhaps the most fascinating aspect of this shop is that they are actively experimenting with temperature-controlling the barrel-aging process. We saw their stainless steel mixing tanks, and secondary aging rooms as well. Finally, proceeding to the tasting room, we were thoroughly underwhelmed with their wines, and left without a purchase. 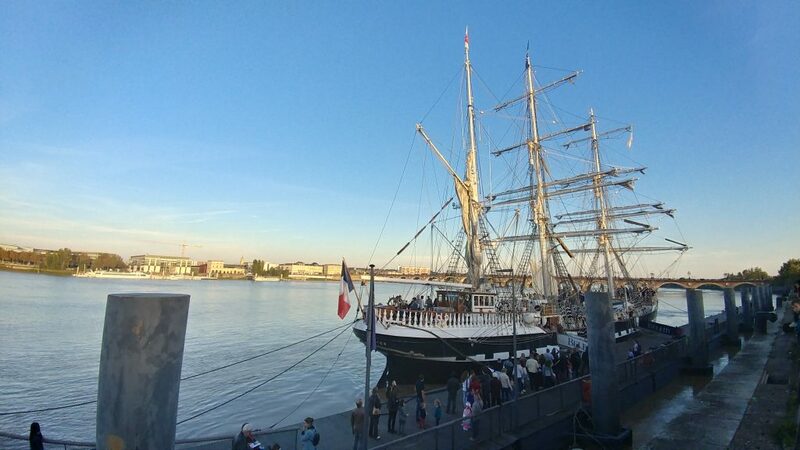 We had bigger plans for tonight, which would take us straight into the heart of Bordeaux. We drove the 45 minutes and parked in the first available garage near the river. Walking along it, we stumbled upon an old sailboat we had heard was docked for a little while here. The sun began to set, but we still had a couple of hours until our dinner reservations, so we wandered around town for a while. Finally, it was time for dinner reservations – at Le Bordeaux owned by Gordon Ramsay himself. We went in as early as we could, 7pm, having made reservations for this time weeks ago. We ordered a charcuterie board to share as an appetizer. For the main course, none other than Gordon’s signature beef wellington to share. A word to the wise, if you ever get the opportunity, get one of these. It’s even more delicious than he makes it look on his TV shows. We washed it down with a 2010 Saint Julien until it was dessert time, Cait had more of a molten lava cake type dish, and I had the lemon meringue pie. After a couple of espressos, we were ready for the 1h30 drive back to the hotel. The drive back proved a little difficult, the amount of fog this area sees can be a little insane – at times cutting visibility to only a few meters. Driving carefully, we arrived back safe and sound around 11pm, in time to go to bed as we needed to be up a little past 6am for breakfast before we were to check out of Bordeaux and be on to our next destination. The last of our time in Bordeaux, we had yet another lovely breakfast at Hotel Rollan de By. Seriously everyone, if you ever visit this area, I cannot recommend this hotel enough. The rooms are lovely, and the staff are some of the friendliest and most helpful we’ve ever encountered. 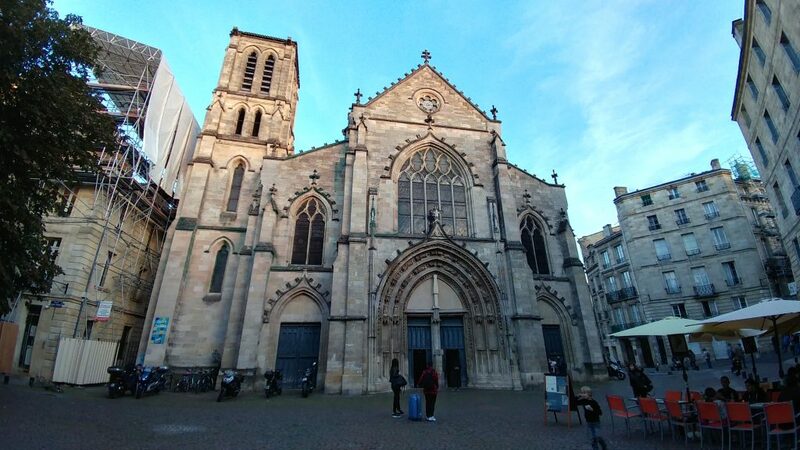 We loaded up our car, checked out and paid our bill, then departed for Bordeaux once more. We filled up the rental car with gas, going from 1/4 tank to full ran us about 50 USD since we calculated gas over here was about USD 5.82/gallon. Avis was a little weird near the train station, they had separate locations for rentals and returns. Nevertheless, we figured it all out, and soon we were at the train station and boarded onto our TGV line. One caveat we faced, even though we had paid for 2 reservations, one of them was for a seat labeled as “place non attribuee(s)”, or basically, “yeah you can take this car – it’s already filled but there’s a couple of luggage-area drop-seats that can be used if all the other real seats are taken.” We sat together as long as possible until an older woman informed me I was in her seat, I checked around for another empty seat but alas I indeed ended up in the drop-seat for the last 2h of the ride. This made napping impossible, but on the plus side, it encouraged me to get more reading done. Soon we would be arriving in Paris for 6 nights. I cannot imagine how much more action-packed the days there will be. 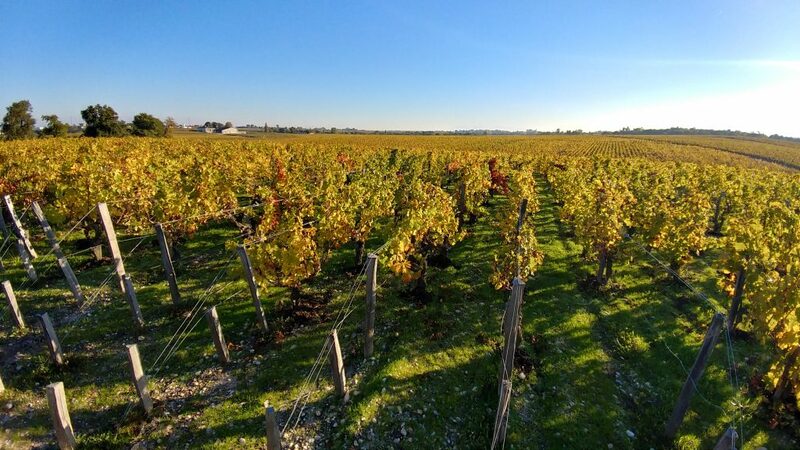 Bordeaux was magnificent – all the charms of country life, 1h away from a major city, and the people were uniformly friendly. 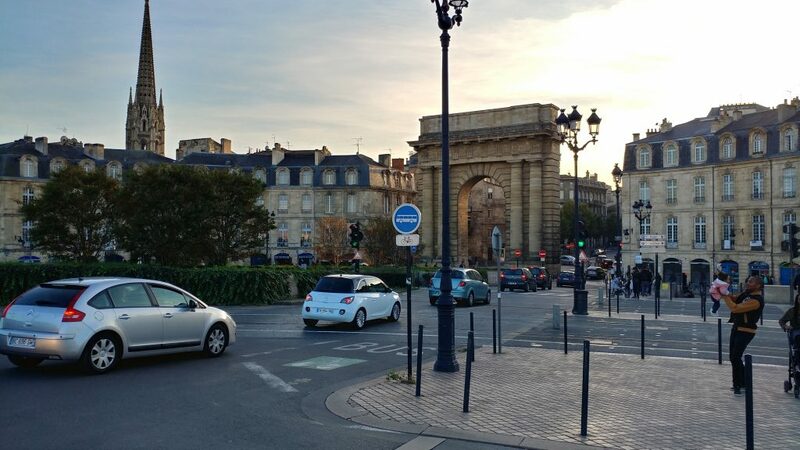 Even driving around Bordeaux center, I noted the fact that despite my ignorance of routes, I wasn’t honked at once. We’ll miss this place, especially having learned so much about their wines and processes. But, the show – errr trip – must go on, so here we come, Paris, see you in a couple of hours!